Kdb+ is a column-based relational database with extensive in-memory capabilities, developed and marketed by Kx Systems. Like all such products, it is especially powerful when it comes to supporting queries and analytics. However, unlike other products in this domain, kdb+ is particularly good (both in terms of performance and functionality) at processing, manipulating and analysing data (especially numeric data) in real-time, alongside the analysis of historical data. Moreover, it has extensive capabilities for supporting timeseries data. For these reasons Kx Systems has historically targeted the financial industry for trading analytics and black box trading based on real-time and historic data, as well as realtime risk assessment; applications which are particularly demanding in their performance requirements. The company has had significant success in this market with over a hundred major financial institutions and hedge funds deploying its technology. 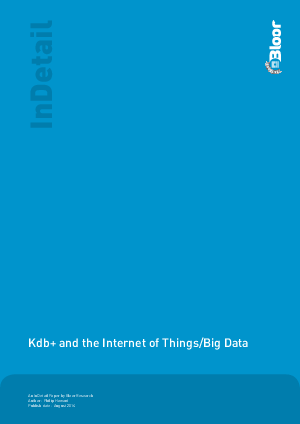 In this paper, however, we want to explore the use of kdb+ for big data and Internet of Things based use cases.